Norwalk, Connecticut – The Connecticut RoughRiders of Eastern Hockey League (EHL) team’s Alternate Captain forward Mitchell Parsons 97’, from Grandville, MI, has committed to NCAA III's The College at Brockport, State University of New York (SUNYAC - State University of New York Athletic Conference) in Brockport, NY for the Fall of 2018. Parsons is having a tremendous season with the CT RoughRIders with 28 goals & 26 assists for 54 points in 34 games thus far. He is currently 9th in the EHL in scoring. We wish him the best of luck next season with the Brockport Golden Eagles. Congratulations to Mitchell and his family! 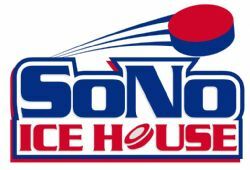 The Connecticut RoughRiders® are based out of the SoNo Ice House in Norwalk, Connecticut. The CT RoughRiders® are members the Eastern Hockey League (EHL) for Junior "A", and the Atlantic Youth Hockey League (AYHL), Connecticut Hockey Conference (CHC) & Eastern Junior Elite Prospects League (EJEPL) at the youth levels. The CT RoughRiders® are affiliates of the Cedar Rapids RoughRiders® - members of the United States Hockey League® (USHL) since 1999. 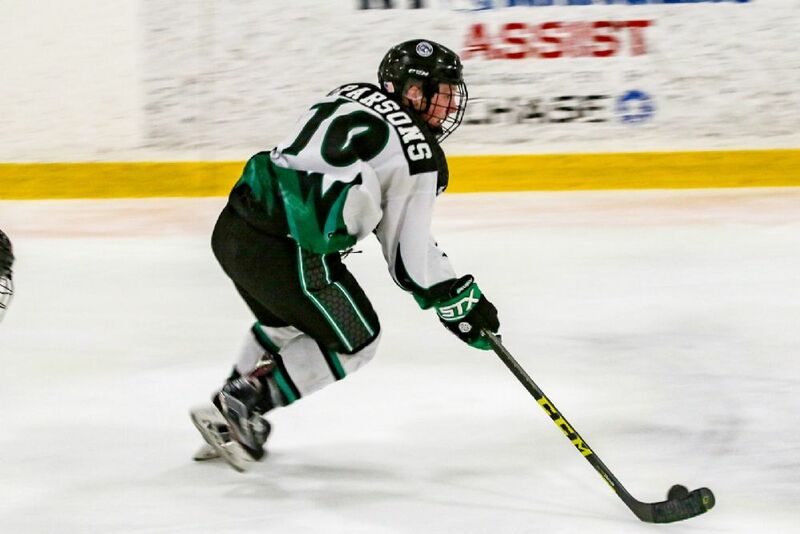 The CT RoughRiders® number one goal is the development of our players not only on the ice but also off the ice and advancing them to the next level. BOSTON, MA -- In less than 24 hours we will turn the page over to December, and the final month of the 2017 calendar year. 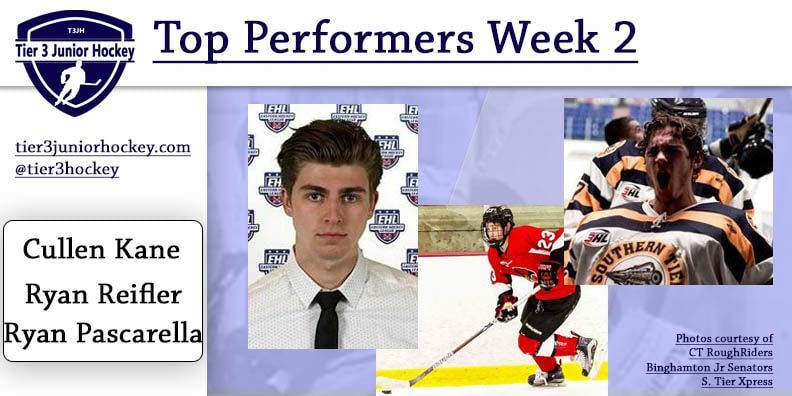 Looking back at November in the Eastern Hockey League (EHL), there was tons of great action amongst the 16 teams and numerous candidates for the latest set of TSR Hockey Stars of the Month. 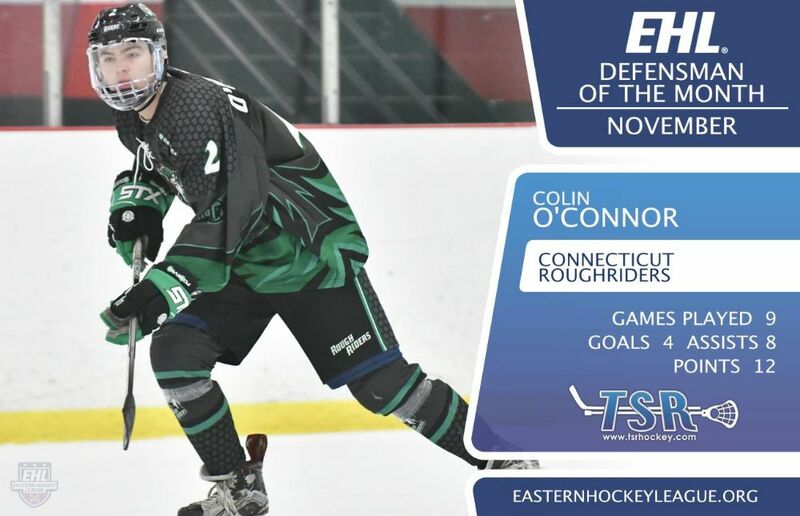 The EHL is pleased to announce that Colin O’Connor (Connecticut RoughRiders) has been named the TSR Hockey Defensive Star of the Month for November. O'Connor led the EHL in defensive scoring with a solid 1.33 points per game average in November. The '98 is in his first season in the EHL, and has 21 total points in 22 total games so far this season. The Connecticut native has filled the void of one of the RoughRiders all-time leading scorers, Marc Happy, who is now manning the blue line up at Plymouth State. O'Connor will look to continue to lead the way for the RoughRiders, as they begin December with an 11-point lead in the Central Division. The December schedule includes seven more games for the RoughRiders, with just three of them in the friendly home confines of the SoNo Ice House. 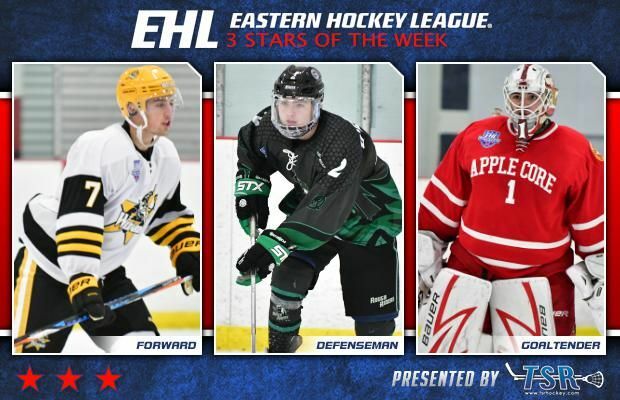 BOSTON, MA -- The Eastern Hockey League (EHL) finished off the second showcase of the season this past weekend at the Haverhill Valley Forum. In total, 10 of the 16 EHL Showcase Series games were decided by just two goals or less, with the North Conference holding an 11-5 edge over the South Conference when the action concluded. Through it all, 82 total goals were scored over the two days, and there were plenty of worthy candidates for our weekly honors. 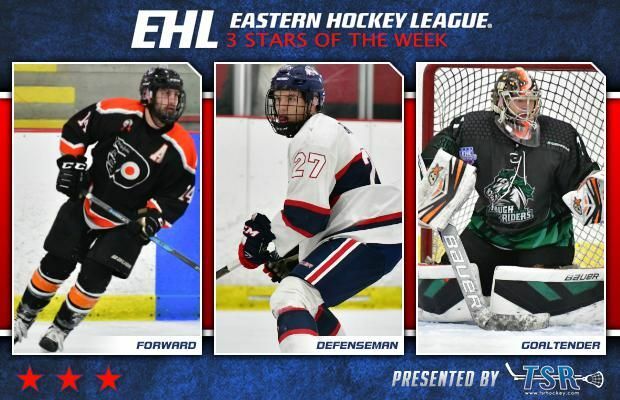 The EHL is pleased to announce that Alex Ochterbeck (Philadelphia Little Flyers), Nick Grinvalds (Boston Jr. Rangers), and Jeremy Thelven (Connecticut RoughRiders) have been named the TSR Hockey Stars of the Week. Thelven and the RoughRiders split their pair of games in Haverhill this past weekend. The native of Taby, Sweden was in net for the victory on Monday, as Connecticut shutout the New Hampshire Avalanche by the score of 2-0. The '98 netminder was solid in net, turning away all 31 shots he faced in route to his 7th victory of the season. After picking up his 1st career EHL shutout, the RoughRiders' anchor will look to continue to lead his team as they host the New York Applecore on Friday and face-off in a home-and-home series against the New York Bobcats Royals on Saturday and Sunday. Colin O'Connor, Connecticut RoughRiders - Defense: O'Connor and the RoughRiders won 1 of their 3 games this past week, as they maintained control of the top spot in the Central Division. While the final results of a pair of the games were disappointing for the RoughRiders, it was a very good week for the '98 defenseman. O'Connor tallied a pair of goals and dished out 4 assists, increasing his overall point total up to 15 for the season. The native of the Connecticut has been rock solid for his team this year, as he is averaging a point per game all while also playing very well in the defensive zone. The week ahead for the RoughRiders includes just a pair of games at the November Showcase. Connecticut will wrap-up their season series with the New England Wolves on Sunday, and then face-off with the #1-ranked New Hampshire Avalanche on Monday. CEDAR RAPIDS — Eight former Cedar Rapids RoughRiders begin the 2017-18 season in the National Hockey League. The list includes five defensemen: Matt Tennyson (Buffalo Sabres), Alec Martinez (Los Angeles Kings), Anthony DeAngelo (New York Rangers), Chris Wideman (Ottawa Senators) and Ivan Provorov (Philadelphia Flyers). This will be the ninth NHL season for Martinez, who played in Cedar Rapids in the 2004-05 season, and has 419 NHL games under his belt. Goaltender Alex Stalock is with the Minnesota Wild. Forwards Justin Abdelkader (Detroit Red Wings) and Tommy Wingels (Chicago Blackhawks) also are on opening-night NHL rosters. Stalock, Abdelkader and Martinez played together on C.R.’s 2004-05 Clark Cup championship team. All 31 NHL teams have at least one USHL graduate. In all, 128 former USHL players are on NHL rosters. Cullen Kane - CT RoughRiders EHL in his first season playing at the Tier 3 Junior Hockey Level, Forward Cullen Kane registered the first (and only to date) natural hat trick of the 2017-18 season. The New York native currently ranks 3rd (tie) among all Tier 3 skaters in Goals Scored and Top 25 in points (tie). 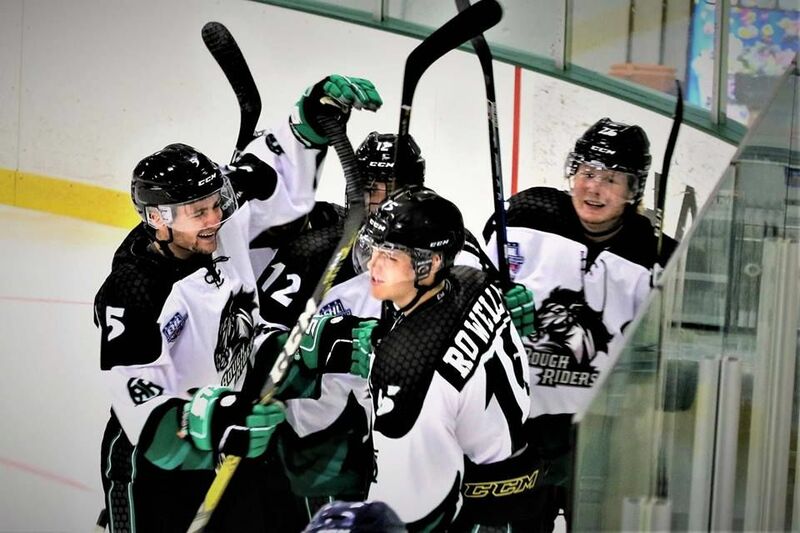 The Connecticut RoughRiders EHL have added a great deal of talent to their team, both at the goalie and forward positions as they gear up for the rapidly approaching season. Two new goalies and six forwards are among the newcomers for 2017-18. The group includes goalie Jeremy Thelven, a native of Sweden whose father (Michael) played for the Boston Bruins in the 1980s. Thelven has been attracting a lot of college interest and will be familiar with at least one of his teammates. Fellow newcomer Andrew Ray played with Thelven at North Yarmouth Academy in Maine. The RoughRiders also welcome in goalie Ryan Bonnvie from the Tilton School, of New Hampshire. Like Thelven, he’s generating a lot of interest from colleges and will have an opportunity to play a key role on the defense. The forward position has been solidified as well, especially with the addition of Ray, who is one of two 1997-born players on the roster. Like Thelven, Adam Sandberg-Nilsson also hails from Sweden. Blake Halfpenny comes to the RoughRiders after playing for the Spokane Braves of the Kootenay International Junior Hockey League last season. 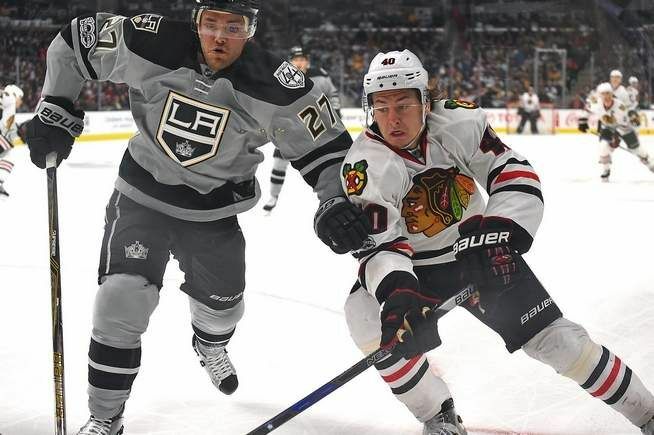 Cullen Kane, the cousin of Chicago Blackhawks star Patrick Kane, is taking his talents to Connecticut. He played for the Fort Erie Meteors last year. The other forwards are Tommy Schwartz and Mitchell Parsons. Parsons played for the North Iowa Bulls of the NA3HL. Schwartz is a product of the RoughRiders’ program (and the Oilers, as the RoughRiders were previously known). He has attended the program’s summer hockey schools. RoughRiders head coach Eric Lind is thrilled about the additions to the team. He can’t wait to see how things work out for them in their first season with the RoughRiders. The Connecticut RoughRiders have a very unique training and development program that focuses on Periodization, splitting the halves of the season into two specific phases of preparation, competition and rest. For more information about Periodization and the Connecticut RoughRiders program, go online to www.ct-roughriders.com or call Eric Lind at 888-326-7989. RoughRiders players play in between 50-70 games per season. This includes games at four well-scouted Eastern Hockey League showcases and in the EHL playoffs. With the recent signing of several out of state players to our EHL CT RoughRiders Junior Team we are looking for additional billet families to house our EHL players for the upcoming 2017-18 season. If you can billet or know of someone interested please let us know!